Animation has seen an interesting growth over the past 30 years or so. For the most part it has been seen a venue for children and as such has been geared for them. But at times there were films and shows that attempted to push past that. Anyone who has enjoyed the Pixar films can attest to the change in style and tone of animation. Most recently television shows have been, once again, changing the landscape for animation. There have been a number of them popping up that have incorporated edgy comedy into their story lines. The newest is a show called Archer on FX. The main story follows a covert ops agent named Sterling Archer who works for an agency named ISIS, which is run by his mother. Having cart blanche to do as he pleases, Archer blunders his way through the simplest of assignments. The other supporting characters include; Archer's mother whom Archer has a very twisted relationship with, his ex-girlfriend who is now involved with the accountant for ISIS, as well as a bizarre mixture of co-workers who over the course of ten episodes go down some twisted storylines. Mixing elements of The Office, James Bond, and Arrested Development you are treated to quite a unique blend of comedy which actually delivers given the format its presented in. The show employs some well-known voice talent. If you have watched or are a fan of Arrested Development then you will recognize the voice of Judy Greer as Archer's mother and other fellow alum's from the show making guest appearances. What it does really well is not to try to be over edgy or raunchy at any moment. Are there raunchy comments? Yes. Are there ways that the show comes off edgy? Yes. But it never feels forced like a lot of sitcoms tend to do. Nor does it feel like a rehashing of what is already out there. It just does exactly what it presents itself as, a funny show that takes all the elements of corporate America, covert agents and espionage and presents them to you with a joyful wit and humor. Now the first season comes to DVD so for those of you already know of the show or anyone who has heard of it, you can enjoy every moment and oddity from this hilarious animated sitcom. It comes in a 2-disc pack, disc one featuring the first five episodes as well as the original unaired pilot episode for the show. Disc two features the second half of the season again with some extras, this time you get the unaired network promo, the making of Archer which includes 3D animation, art direction, backgrounds, illustration, and storyboards; finally ending with some deleted scenes. One bonus for any fan of FX in general, there are two pilot episodes from other shows contained within the two discs, one being the Louie pilot and the pilot for The League. Regardless of all the attention that animation has been getting as of late its good to see that there are people out there who are willing to look past what most people see it as and try something different. We could spend a while going over the shows that have helped pave the way for animation from children's shows to more adult fodder but that's not really the point here; what matters is that animation is finally getting the attention it has always deserved and, quite frankly, needed. 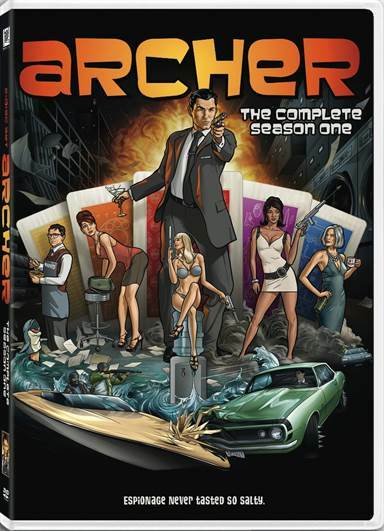 Download Archer: Season 1 from the iTunes Store in Digial HD.